The boys go ziplining on their Spring break trip to the Rockies on South Park. 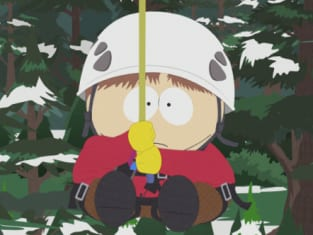 "I Should Have Never Gone Ziplining" is the 6th episode of the 16th season. South Park Season 16 Episode 6: "I Should Have Never Gone Ziplining"
Cold sore is what girls call it, Kenny. It's actually herpes. Permalink: Cold sore is what girls call it, Kenny. It's actually herpes. For four elementary school boys, an ordinary day becomes a descent into madness on "I Should Have Never Gone Ziplining."